I always make my sweet potato casserole for both thanksgiving and christmas and it is SO good, but since I recently made it a few weeks before thanksgiving for a friendsgiving – I wanted to try something new for thanksgiving. 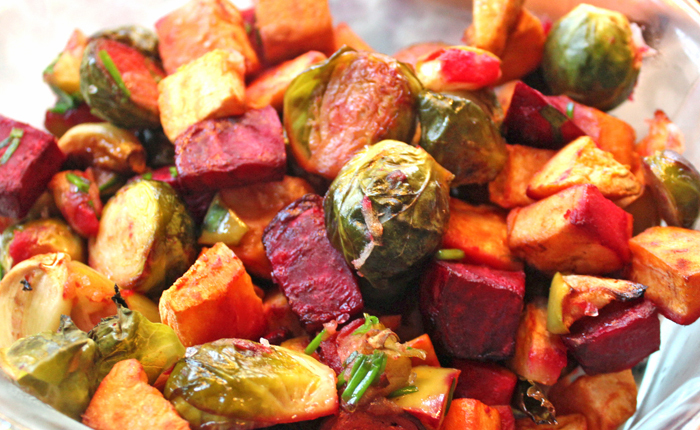 these roasted veggies were at the friendsgiving and even though I don’t really care for brussels sprouts, I really liked the dish. I asked for the recipe and then made some changes to it, her recipe includes bacon and mine doesn’t so if you want to add bacon – go for it! side note, I didn’t realize until writing this post that there is an ‘s’ at the end of brussel… who knew. and how beautiful are these colorful vegetables?! I also have to talk about this awesome monogrammed casserole carrier from marleylilly, y’all I’ve been wanting one so bad and finally got it for this dish, I actually chopped all the veggies at my house first, put them in a 9×11 dish with lid (obsessed with these from crate and barrel, and cheap too!) and brought it in the carrier over to my parents’ house on thanksgiving day. it was so easy, sturdy, and adorable! 2. in a large bowl, mix together all ingredients except chives/rosemary and stir until coated with oil and spices. 3. cover a baking sheet with parchment and spread veggies in a single layer. 4. bake until tender and golden, about 30 minutes. 5. sprinkle with fresh herbs and serve! Dimana tempat jual viagra asli ? Banyak sekali kita temukan saat ini situs yang jual obat viagra . Sebelum membeli obat kuat viagra sebaiknya Anda harus teliti , karena banyak jual produk palsu beredar di pasaran . Disini , kami akan coba bantu untuk menemukan situs yang terpercaya yakni PilBiruAsli[com] . Situs tersebut menjual viagra dengan kualitas terbaik . Silahkan kunjungi untuk mendapatkan keterangan lebih detailnya seperti harga pil viagra dan cara belinya .